Create, Play & Communicate – Superb gameplay, functionality and control. This isn’t a game, it’s a way of life. 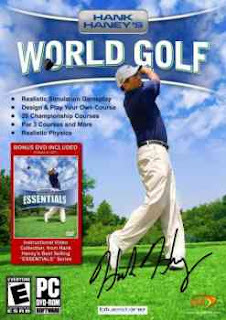 Hank Haney’s World of Golf features New Course types, Championship Golf, Pitch and Putt, Par 3, Crazy Golf, Mini Golf; New game modes including Stableford, Practice, Nearest the Pin, Longest Drive etc. ; Improved draw distance, allowing the entire course to be displayed in the distance; Zero load times between holes; All new characters and animations; Realistic physics and gameplay; Real-time passing of time – choose your tee time and watch time fly; All new graphical effects including enhanced lighting and shadow systems for objects and terrain, normal map, detail map, mega-texture; Course editor allows you to customize and create your own courses. :nangis :rate :lebay :hoax :nyimak :hotnews :gotkp :wow :pertamax :lapar :santai :malu :ngintip :newyear.